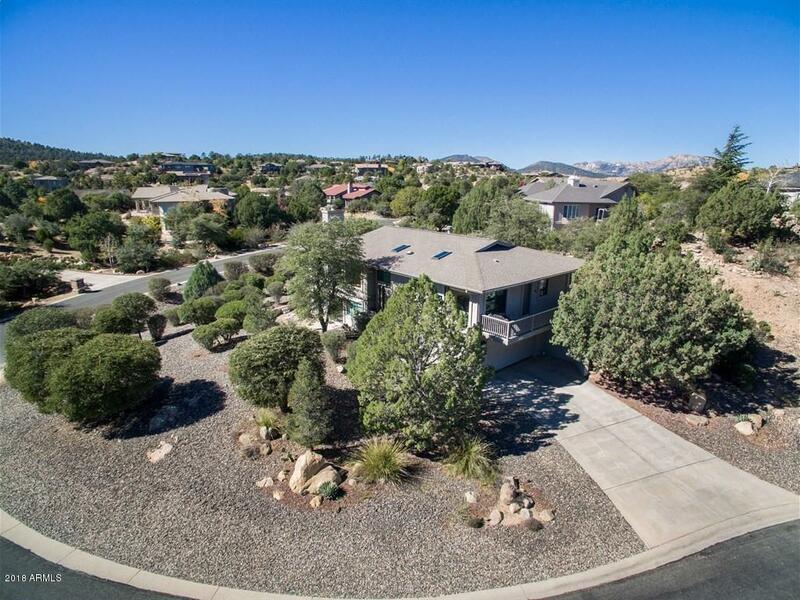 Beautiful home in Forest Trails just a short drive to downtown Prescott featuring dramatic views of Thumb Butte and surrounding National Forest. This 3 bedroom + Den, 3 bathroom home offers a large 2 car garage on a .54 acre professionally landscaped lot with native trees, front patio, level driveway and large storage room off of garage. Kitchen features granite counters with island, custom wood cabinets, Dacor appliances & wonderful breakfast nook with views. Main floor features oak flooring with gas fireplace, formal DR, large mastersuite with walk in closet and doors leading to rear patio, Lower level features cozy den with Brazilian cherry flooring, lots of windows, large 3rd bedroom and bathroom with shower, kitchenette and storage. Steam shower in 2nd bathroom.